Of all the tips, recipes, and compliant food finds I shared on the @Whole30Recipes Instagram takeover I did last week, I got the very most questions about a few very specific things. The first is hair. Ha- I will go over this in another post! The second is jewelry (all about this on my Instagram; you guys are seriously my kind of people). 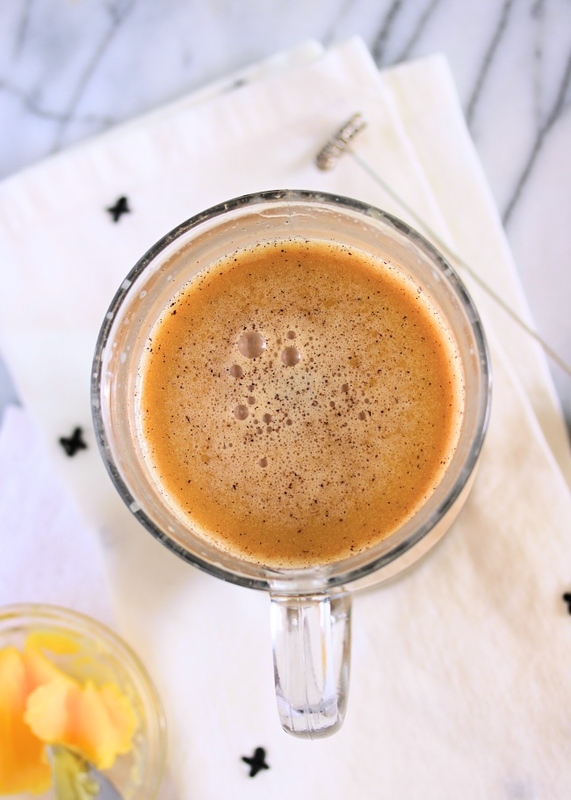 The third was my daily bulletproof coffee-- which is why we are here today! I've messaged the recipe directly to so many of you, I've saved it to my Instagram feed, but I figured an official blog recipe was in order so that you guys would have something to "Pin" and a real recipe to refer back to. 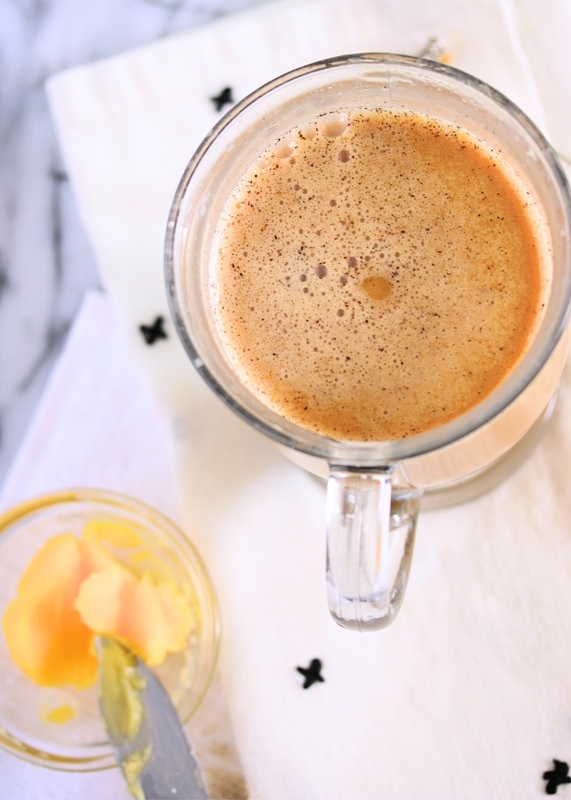 Let's start with some FAQs about my go-to morning drink! Basically, it's a "butter coffee". At least that's how I use the term. Technically, it's a phrase coined by the Bulletproof brand (click here to visit their site) who sells a brand of MCT oil that is to be used as a healthy fat addition to your cup of coffee. Many combine grass-fed butter or ghee with the oil (derived from coconut oil) and this is their form of Bulletproof. If you want to use both fats- go for it! But I typically just go for a high quality, grass-fed ghee because I enjoy its flavor & texture the most. I then add a collagen creamer & a liquid creamer (with an almond/coconut base) to make mine, well... creamy. Because #beigecoffee. My why comes down to two things. 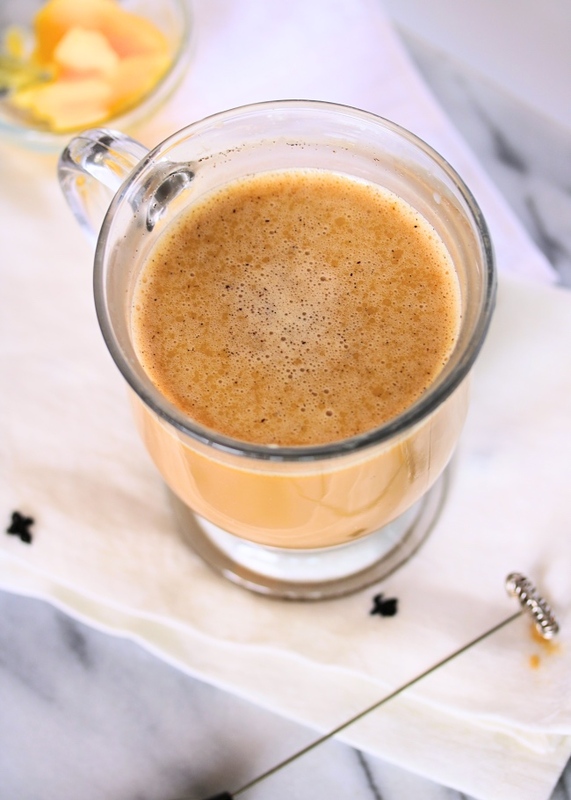 1) I enjoy delicious coffee, and the ghee and creamers combined make my coffee delicious. 2) Healthy fats are very important to me! While this coffee is delicious in the morning & I do look forward to it, I love it most for the nutrition. I swear by lots of healthy fats in my diet to keep my digestion running smoothly, and to keep my hair growing, skin glowing, and nails strong. This also fills me up & gives me great non-buzzy energy to last through the morning. When do you drink it? The Whole30 is all about balanced, controlled eating: three solid meals a day to keep you full & get in all of the nutrients you need. So when I'm Whole3ing, you can find me drinking this in the morning, either with or just before my breakfast. I still eat a typical breakfast, this just adds a little protein and some healthy fats. When I am not completing a Whole30, I usually feel my best when doing some form of intermittent fasting. 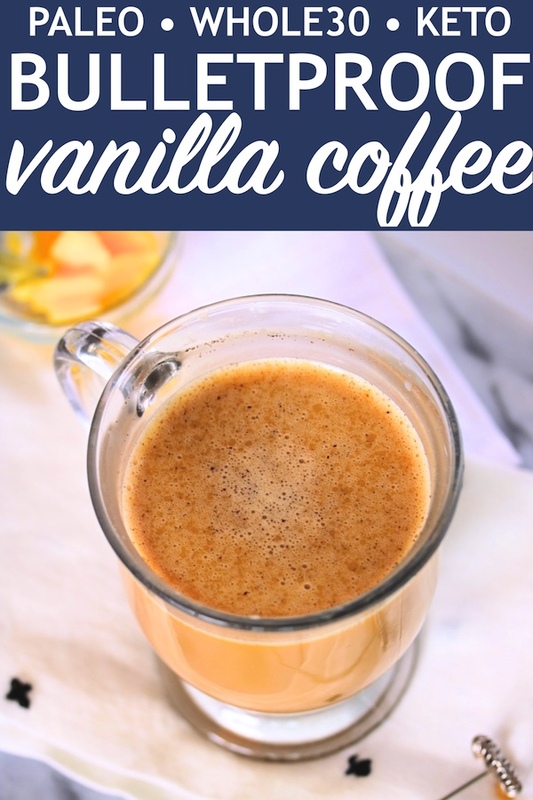 This is a great way to finish off my fast, with a nutritious coffee to sip throughout the late morning until I eat in the afternoon. (So basically, this is my "late breakfast".) Do what feels right & works for you! Now on to the recipe... and don't forget, you can mix this up for what you enjoy most! Add the ingredients to your hot coffee. Use an electric frother (this is what I use), immersion blender, or standard blender to blend until frothy and smooth. I can't wait to make this once I get all of my Whole 30 ingredients. 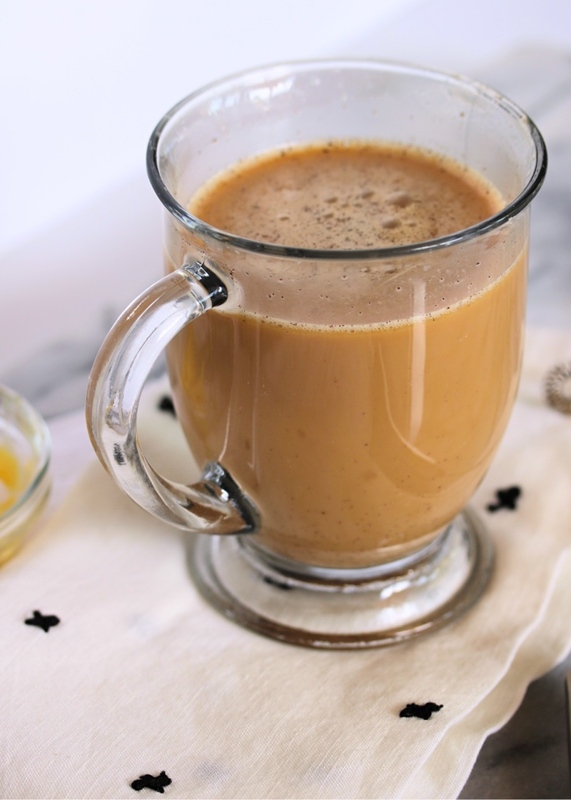 I love a good bulletproof coffee, but I worry that over the holidays when I'm eating crap the fat in the coffee will be another added source of weight gain. Any thoughts on that? Looking forward to doing my 2nd Whole 30 starting January 5th and even more excited to add your blog to my list of resources! Thanks for the great content! Just curious...does your vanilla bean ghee have vanilla beans in it? I ordered this ghee from Amazon-it says Vanilla on the label-but it smells and looks just like regular ghee. I'm wondering if I got a dud jar?! I’m thinking you got regular ghee. I got mine from Amazon today. It smells so deliciously caramel-y that I could eat the jar! Definite vanilla scent! I read that eating or drinking anything with over 75 calories will break your fast when doing intermittent fasting. Thoughts? Would the Bulletproof brand vanilla collagen peptides be a good Whole30 substitute? It was all I could get.